This week, Pandora announced that they are bringing their Genome Technology to podcast recommendations. The beta went live yesterday and is available to users on iOS and Android, but if you’re one of those folks who aren’t interested in downloading yet another app to your phone, there’s an alternative already on the market and it’s called Listen Notes. In the last three years, Podcast popularity has skyrocketed while podcast discovery tools have lagged behind. Wenbin Fang, the founder of Listen Notes and avid podcast listener, recognized this gap and decided to take the solution into his own hands. 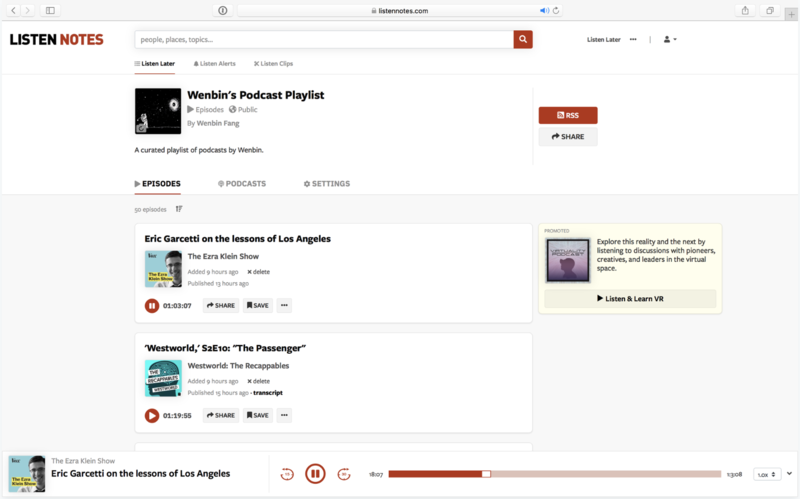 Fang launched Listen Notes in 2017, a standalone podcast search engine website that advocates an episode-centric way to discover and consume podcasts. One of Fang’s biggest gripes about podcasts was the inability to save an episode without subscribing to all of a podcast’s episodes. With Listen Notes, you can curate your own list of episodes using the “Listen Later” feature and even share or invite others to contribute to this list. When you’re ready to listen to your list, Listen Notes lets you easily import it into your favorite podcast player via RSS — no subscription necessary. Furthermore, if you’ve got a favorite topic, you can choose to receive “Listen Alerts” which is similar to Google Alerts. What’s particularly great about Listen Notes is that it is as useful for entertainment as it is for research. You have access to the entire internet of podcasts and can search for more than just your favorite topics. Anyone can look up people’s names and find all podcasts episodes that interview or talk about this individual, journalists and students can easily conduct research, and podcasters can also find cross-promotion opportunities. Listen Notes even has a “Listen API” tool to allow developers to build their own podcast apps.